"Victoria, Gabriel and I were in Walmart today and we accidentally knocked down one of the displays. Of course our natural reaction was to begin picking up what we had knocked over, but the thing that surprised me was how many times the Walmart employees thanked us for picking it up. What do people usually do when they make a mess in Walmart?" "Unfortunately, the entitlement culture we live in conditions us to think that grace eliminates our need to have any part in cleaning up our own mess. Doesn't just apply to Walmart." Allow me to explain that last sentence with a modern-day parable about salvation. Once upon a time you were having a no good, very bad day. In your angry haste to get out of Walmart, you knocked a jar of pickles off the shelf. The contents splattered several fellow shoppers and all over the aisle. The pungent pickle aroma from the stink bomb exploding at your feet, rapidly threatened to overtake the store. Panic gripped your heart. Question: Do you have any responsibility in a situation such as that? But what if you don't know where the cleaning supplies are kept? What if the rapidly spreading pickle juice is becoming a hazard to other shoppers? What if you are unable to contain the spill? What if it is simply beyond your ability to clean up your own mess? What then? Bigger Question: Do you still have a responsibility in a situation such as that? Many in the religious world have concluded that, because we are totally incapable of saving ourselves, all personal responsibility in the salvation process is eliminated. But is that what the Bible says? What does God say about "unconditional election"? What does God say about "irresistible grace"? "As God's co-workers we urge you not to receive God's grace in vain." Let's go back to the pickles. So there you are standing alone in an aisle that is overwhelmed by the stench and broken glass of your mistake. You are helpless. You are incapable of saving yourself. What do you do in a situation such as that? I know what many in our entitlement culture would do, they would walk away. Very Important Application: Even the lost have choices. Even the lost have responsibility. Even the lost are expected to acknowledge their condition and accept help from the One Who can clean up their mess. Does their request for help make up for their mistake? No. Does their request for help earn the assistance from another? No. Does their request for help give them the right to claim they cleaned up their own mess? No. The only thing their decision allows them to claim is that they made an unfortunate mistake, they chose to humbly surrender to capabilities of another, and now they owe that person a very great debt of gratitude. We cannot save ourselves! But making a mess does not give us the right to walk away from it, even if we can't clean it up ourself. It does not give us the right to claim an entitlement version of grace without responsibility. The mess we have made can only be cleansed by One Person. Only He can save us. Only He receives the glory for our salvation. But we still have responsibility! We must surrender to Him! James 4:7-8 (NIV)"Submit yourselves, then, to God. Resist the devil, and he will flee from you. Come near to God and he will come near to you." "... choose for yourselves this day whom you will serve ... But as for me and my household, we will serve the Lord." "Anyone who chooses to do the will of God will find out whether my teaching comes from God or whether I speak on my own." "With many other words he warned them; and he pleaded with them, 'Save yourselves from this corrupt generation. 'Those who accepted his message were baptized, and about three thousand were added to their number that day." Acts 17:26 (NIV)"God did this so that they would seek him and perhaps reach out for him and find him..."
1 Corinthians 15:2 (NIV)"By this gospel you are saved, if you hold firmly to the word I preached to you." "This is good, and pleases God our Savior, who wants all people to be saved and to come to a knowledge of the truth." "Blessed is the one who perseveres under trial because,having stood the test, that person will receive the crown of life that the Lord has promised to those who love him." "Therefore, get rid of all moral filth and the evil that is so prevalent and humbly accept the word planted in you, which can save you." The Bible teaches that we are responsible for our sin. Once we discover our inability to solve our sin problem, we have the responsibility to make the freewill choice to accept God's grace. Even the helpless have choices. Even the lost have a personal responsibility. 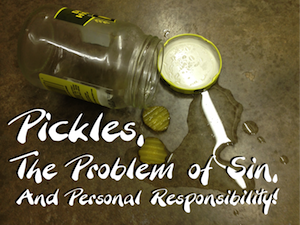 Back to Top of "Pickles, The Problem of Sin, And Personal Responsibility"